We’d love your help. Let us know what’s wrong with this preview of The Complete Book of Small-Batch Preserving by Ellie Topp. The easiest and safest methods for making delectable preserves in small batches -- all year long. "Takes the pressure off cooks who don't have much time... but still want to savor the season's bounty." The Complete Book of Small-Batch Preserving takes the guesswork out of home preserving. Both beginners and pros can make the most of fresh fruits and vegetables when these are readily available and inexpensive. Because these recipes require a minimum of time and fuss, home cooks will enjoy creating the preserves almost as much as everyone will enjoy tasting them. Jams, jellies and low-sugar spreads Conserves, butters and curds Pickles, relishes and chutneys Salsas, mustards and marinades Flavored oils Dessert sauces, syrups and liqueurs. 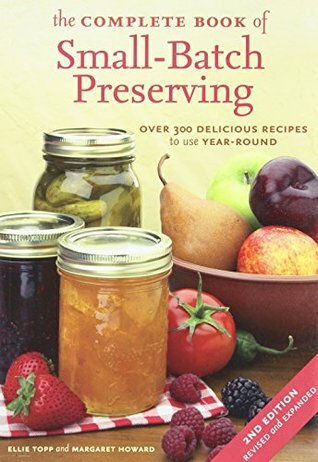 With delectable recipes and professional tips, The Complete Book of Small-Batch Preserving is the ideal guide for anyone who craves home-made preserves but doesn't want to spend all day in the kitchen. To ask other readers questions about The Complete Book of Small-Batch Preserving, please sign up. I love being a beginner preserver, and this book has been great so far. Some of the recipes have left me guessing, but with experience, I think that I'll get the hang of it a little better. I made the Maple Honey Butter without incident. I love that everything is in a small batch! This is perfect for my little kitchen, and my modest amount of time. Terrific book, covering jams, jellies, marmalades, conserves, pickles, chutneys, salsa, flavored oils and vinegars... whew! True to the title, all are geared for small batches, so you don't need a bounteous harvest from the garden or orchard. It's possible to make lovely preserves of all sorts even if you rely on produce and ingredients from the farmer's market, grocery produce or gifts from friends. Most of the recipes, and all that I've done to date, use a water-bath rather than a pressure coo Terrific book, covering jams, jellies, marmalades, conserves, pickles, chutneys, salsa, flavored oils and vinegars... whew! True to the title, all are geared for small batches, so you don't need a bounteous harvest from the garden or orchard. It's possible to make lovely preserves of all sorts even if you rely on produce and ingredients from the farmer's market, grocery produce or gifts from friends. Most of the recipes, and all that I've done to date, use a water-bath rather than a pressure cooker, so no special equipment is needed. I've had this checked out from the library twice now, and have littered little Post-It markers throughout the book! Maybe it's time to order my very own copy. I'm a little in love with this book, which covers jams, jellies, marmalades, conserves, pickles, chutneys, salsa, flavored oils and vinegars (the latter two I'll never make). By far this one is my favorite canning cookbook I've read so far, ever. It focuses on small batch water bath canning - exactly what I'm looking to do. Make small batches of food, using ingredients mainly from my garden, with maybe a couple of things added (like peppers, because my garden right now is just not producing pepp I'm a little in love with this book, which covers jams, jellies, marmalades, conserves, pickles, chutneys, salsa, flavored oils and vinegars (the latter two I'll never make). By far this one is my favorite canning cookbook I've read so far, ever. It focuses on small batch water bath canning - exactly what I'm looking to do. Make small batches of food, using ingredients mainly from my garden, with maybe a couple of things added (like peppers, because my garden right now is just not producing peppers). Another reviewer mentioned the book had a "vintage" feel to it - the recipes, that is, not the book itself - which is probably why I like the recipes so much. A useful book, and I'm thankful for something that doesn't ask for an entire bushel of produce! Unfortunately, what I needed was a Lemon Curd recipe. This has one, but it's for the microwave...which I don't have. Bummer, really, but I did copy out several other recipes to try. I'm enjoying this book tremendously. It's giving me all sorts of ideas for canning and even for winter projects. My plan for winter now includes making my very own mustard! Fun. They are very toe-the-line in the book when it comes to all the new-fangled canning rules - I'll stick to the old ways, thanks. But in today's foam-padded world I guess that's the way all the books are going to be. What I really need is a canning/preserving book written about 50 years ago, when the people writing the boo I'm enjoying this book tremendously. It's giving me all sorts of ideas for canning and even for winter projects. My plan for winter now includes making my very own mustard! Fun. They are very toe-the-line in the book when it comes to all the new-fangled canning rules - I'll stick to the old ways, thanks. But in today's foam-padded world I guess that's the way all the books are going to be. What I really need is a canning/preserving book written about 50 years ago, when the people writing the books actually canned themselves, ha ha. Recommends it for: Anyone who wants to do some canning! I love this book! The instructions are great and easy to follow for someone who has never canned a thing. There is a fabulous variety and I'm planning to do lots and lots of canning with our backyard garden stuff this year! It's a small garden, so this is perfect for those little batches and better yet, I won't be "stuck" in the kitchen all day! This book has some of the best recipes for canning that I have ever tasted! I loved that these were for small batches, they only made a few pints of the recipe instead of like tons of it. The pickles are great, loved the blueberry jam recipes, loved the apple butter, the salsa and pasta sauces are fantastic. This is one great book. Well written with over 300 recipes. Measurements are in both metric and Imperial. Written for small batch so a nice way to experiment. A detailed description of safe canning techniques is given as well. Jams, jellies, marmalades, pickles, beet pickles, pickled garlic, and more. This is the one for small families, single people and just a dab of homemade produce set aside from one's home victory garden. Enjoy! Great book with lots of creative recipes! Lots of delicious-sounding recipes and clear, useful instructions. Great recipes for small quantities of fresh veggies. Everything from jams to marinades, pickles to flavored oils. I own this book. Includes vinegar, flavored oils and Asian sauces. Also the recipes are much smaller than more traditional canning books. Rating goes to 5 if I break down and buy it. I've already made several recipes and have been enormously proud of myself. Easy to follow and the results are terrific. Can't recommend it highly enough. It is full of good recipes. I can't wait to get started on preserving my harvest. Fabulous. So many wonderful recipes. I borrowed it from the library and have to own a copy for myself. I love, love, love this canning book. Awesome recipes. I just wish I had more things to can. And more time. And more shelf space. And more jars. You get the idea. got it for the 20 Peach recipes. Woohoo! Fell in love with this one! Jellies and jams. Relishes. Chutneys and Conserves. YUM. Fantastic. The best small batch canning book I own. Good book for canning small batches. There were several recipes in the book that I want to make. It was worthwhile to check it out from the library. This book was so promising: lovely production, clean layout, well written a wide range of simple recipes, and straightforward organization. Nice clear instructions from start to finish. Too bad that many of the recipes either don't work or give poor results. Out of 8 or 10 that I've tried only one was a hit. The rest were edible but not worth repeating. I suggest you not buy this book but rather get a copy from the library and see for yourself. I haven't made any of the recipes but am currently reviewing books to decide what I might want to refer to when I finally get a chance to preserve a few things. I took this out thinking my energy and that funny thing called "time" would let me get there this year. I like the aim of smaller yields, but didn't take good enough notes while I was reading it, so I'll have to revisit this one again when I'm closer to the project. I liked this book, though not as much as the other small batch preserving book I recently read. I think I'm less likely to use the recipes in this book - though there are LOTS - so almost anyone could find a recipe or two useful. I would recommend to those who enjoy a vintage flavor palette, many of this are heritage recipes and flavors. Straight up better than Ball. Ball is a great start, but this is well written with through anyalsis on canning, freezing and other methods. The recipes are more applicable to our lives and well, the variety is better. This book one it's last star because it promotes using no pectin where pectin is not needed, which, if you know me, makes me smile. I like the concept of this book as I have a very small garden of veggies, and I am the only one consuming what is harvested/canned. The recipes are decent but seem incomplete. Several of them do not follow safe canning practices - it is easy enough to compensate for such but it would be nice if the recipes were complete and straight forward.